Ready to play? 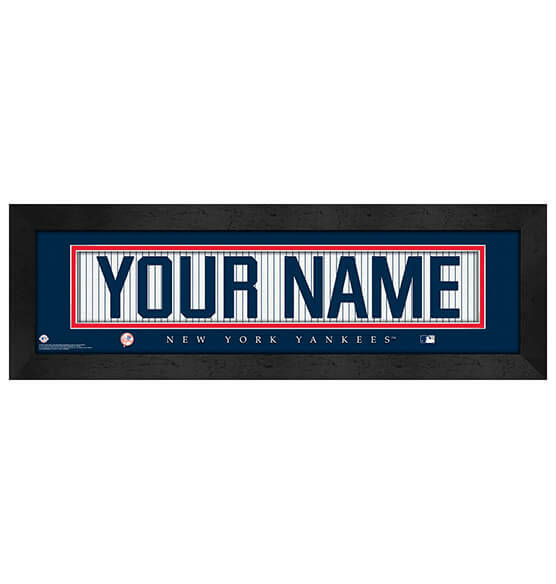 Go all in with our New York Yankees Personalized Nameplate Framed Art decor designed to look like the back of a real Yanks jersey. This made-to-order print features any name you specify to be featured on this premium framed decor piece up to 12 characters. Ideal for any spot in your fan cave, this MLB-licensed product features team colors, a team logo and a high-quality print that's nestled behind glass. The frame has a sleek black finish and arrives at your door ready to hang. Need an anniversary, birthday or holiday gift for a family member, co-worker or friend? This piece is sure to knock your gift-giving reputation out of the park!